Mansfeld Middle Magnet Middle School is the home of Tucson Unified’s STEM Magnet program in middle school and is proud to sponsor a phenomenal Science Olympiad Team. The team was founded in 2013 with a small group of students and has expanded every year. The current team of students meets after school and works independently on weekends to prepare for various competitions throughout the state. Each year the team competes in 23 events that range from engineering events, to general knowledge events, to performance tasks. Students specialize and develop expertise in four events with older students serving as mentors to incoming team members. Students compete as individuals and as part of the team. 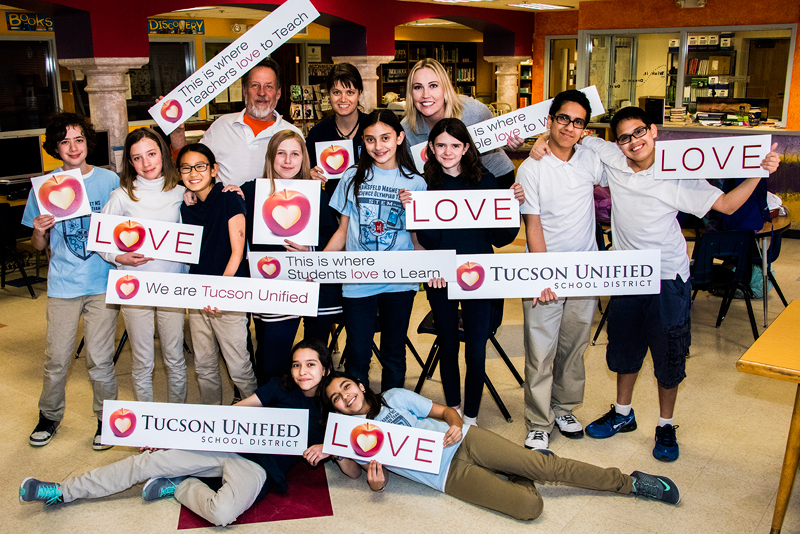 Because of the students' hard work, this team has pulled together to bring increasing accolades to the both Mansfeld and Tucson Unified. Emma (grade 7): I enjoy being part of a team because they help you no matter what! Jesus (grade 7): I like Science Olympiad because the activities are cool and makes me learn things I didn’t already know. Maya (grade 7): I enjoy participating in Science Olympiad because I learn many things, improve teamwork skills, and meet people from different grades. Erubiel (grade 8): I like Science Olympiad because it expands on the subject of science. Trent (grade 8): I like doing the research competitions. Chezi (grade 7): I like being on the Science Olympiad Team because I like being able to work with my friends while learning. Lia (grade 6): I like being on the Science Olympiad Team because I get to work with my friends and I like the teamwork involved. Savannah (grade 6): My favorite thing about Science Olympiad is that I get to learn a ton with my friends and get to create a lot of cool things. Eliana (grade 8): I like being part of Science Olympiad because it gives me a chance to connect with my friends while learning science. Coach Bittel (Magnet Coordinator): I love coaching Science Olympiad because it gives kids a chance to compete in an academic setting and teaches them that failure is just a step along the road to success. Coach Smith (7th Grade Science Teacher): I love seeing students get excited about being able to participate in science as an extracurricular event. Coach Eberlein (Science Olympiad Teacher): I love helping students apply theory to real work problems and materials.